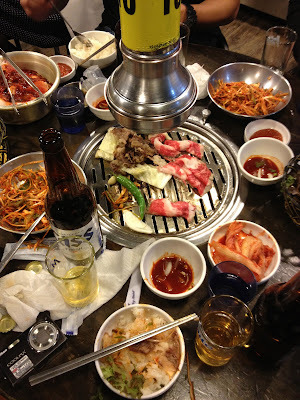 We randomly selected a restaurant for some Korean BBQ. This one was called the New Village Restaurant, full of people, loud, and chaotic. A woman sat our party of 5 at a rather small round table by American standards. At the center of the table was a pit with coals, ready for some grill action. The staff spoke no English so we tried our luck with pointing to menu pictures of meats and beers to get started. We drank Cass beer and made sure to pour it for each other and never for ourselves. That’s the Korean way, never pour your own drink! 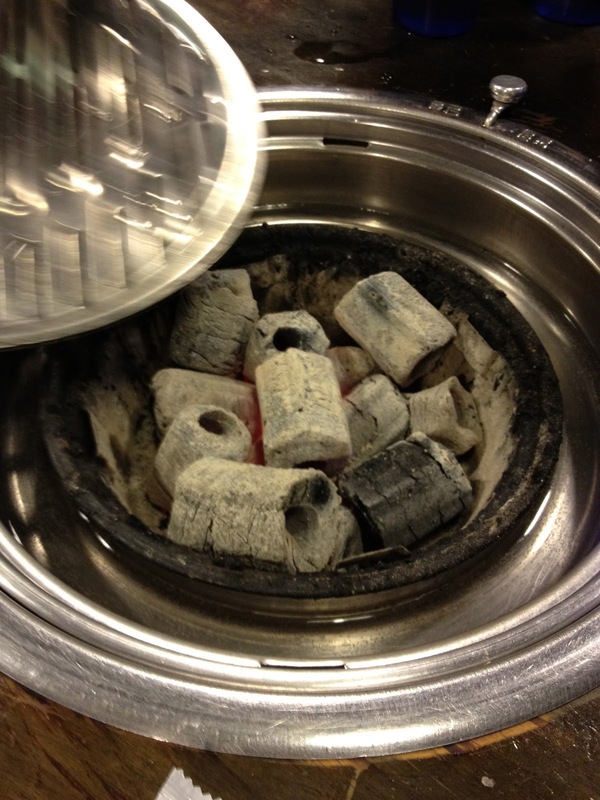 When our sassy waitress came back with a tray of raw kalbi, she scattered the meat over the grill and lowered the fan, attempting to consume all the smoke. While the meat was cooking on the grill with whole garlic cloves and jalapenos, we investigated our side dishes. A basket of lettuce cups and raw cabbage, kimchi, rice, scallions, and a few dipping sauces. There were no plates, and it was strictly chopsticks only to maneuver large chunks of meat and cabbage. I tried to eat each lettuce wrap in one bite despite the mess I was making of the table and myself. The next meat to hit the grill was beef bulgogi. This was marinated beef and less fatty than the kalbi. By the end of the meal I was entering yet another food coma. On the way out, I notice another group leaving. The waitress returned their jackets that were set aside in plastic bags to avoid smoky fumes. Very smart. It’s a shame I didn’t know of this custom. Next time in Seoul I will make note of it, but for tonight, I will roam the streets and bar hop smelling like garlic and beef bulgogi!